Call, text, email, or send up some smoke signals, however you want to communicate is fine by us (although our smoke signal interpreting skills are a little rusty). Certifications may just be a cute little icon, but they also show a dedication to continuing education. The best part of having a travel agent is having someone who really wants to get to know you and find the perfect travel for you! You can call, text, email, or message us on facebook, whatever is convenient for you. If we don't answer when you call please leave us a message, we are devoted to giving all our clients the very best experience, and sometimes that means not putting someone else on hold. 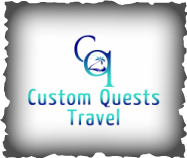 Let us know what kind of quest we can plan for you!